A paper unifying cosmic ray interaction, CFC's ozone, and warming | Watts Up With That? Calculated change in equilibrium surface temperature (ΔTs) (solid curve in green) due solely to CFCs, HCFCs and CCl4, with a climate sensitivity factor α=0.9 K W-1m2 and a climate feedback amplification factor Β=2. Observed global surface temperature data (bars) were from the UK Met Office Hadley Centre; the red curve is a 3-point average smoothing of observed data (updated from Fig. 6 in Lu ). 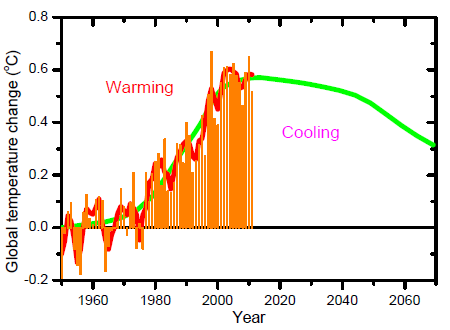 for global warming in the late half of the 20th century [Q.-B. Lu, J. Cosmology 8, 1846-1862(2010)]. Surprisingly, a recent paper [J.-W. Grooß and R. Müller, Atmos. Environ. 45, 3508-3514(2011)] has criticized these new findings by presenting “ACE-FTS satellite data”. Here, I show that there exist serious problems with such “ACE-FTS satellite data” because the satellite has essentially not covered the Antarctic vortex in the presented months (especially winter months during which most effective CRE reactions are expected) and that the criticisms do not agree with the scientific facts in the literature. Instead, real data from multiple satellites provide strong evidence of the CRE mechanism. So far, the CRE mechanism is the only one that reproduces and predicts 11-year cyclic variations of ozone loss in the Antarctic O3 hole and of resultant stratospheric cooling, and the CFC mechanism can well explain both recent global warming and cooling. These findings should improve our understandings of the ozone hole and global climate change. be most pronounced during solar maxima and opposite in phase to the O3 loss caused by CRs . formation of the O3 hole is related to human-made chlorofluorocarbons (CFCs) such as CF2Cl2 (CFC-12) and CFCl3 (CFC-11). (3) heterogeneous chemical reactions of inorganic halogen species on ice surfaces in PSCs to form photoactive Cl2 and HOCl in the winter lower polar stratosphere. Finally, the sunlight-photolysis of photoactive halogens produces Cl atoms to destroy ozone in the spring polar stratosphere. These are the widely accepted explanation of the O3 hole. (expected)). In fact, there has been no O3 loss observed over the Equator in the past four decades. These observations are inconsistent with the above predictions from photochemical models and indicate that the current photochemical theory of ozone loss is incomplete or wrong. As noted recently by Manney et al. , the ability of current atmospheric/climate models to predict the future polar O3 loss is very limited, and improving the predictive capabilities is one of the greatest challenges in polar O3 research. To place the Protocol on a firmer scientific ground, it is still required to obtain a correct and complete ozone depletion theory. solid ice surfaces by Ryu et al. and Wolf and co-workers [51, 52]. Remarkably, Stähler et al. have recently measured a very large DET dissociation cross section up to 4×10¯12 cm2 for CFCl3 on D2O ice, which is comparable to those observed for CF2Cl2 adsorbed on H2O and NH3 ice, being ~1×10¯14 and ~6×10¯12 cm2, respectively by Lu and Madey . The DET mechanism has also been confirmed by several theoretical simulations [53-57]. molecules in atmospheric reactions of sea salts. Lu and Madey  therefore proposed the observed large enhancement of anions (Cl‾) from DET reactions of halogenated molecules adsorbed on PSC ice surfaces as an unrecognized mechanism for the formation of the O3 hole. It was proposed that resultant Cl‾ ions can either be rapidly converted to reactive Cl atoms to destroy O3 molecules, or react with other species at PSC ice surfaces to release photoactive Cl2 and ClNO2 in the winter (dark) polar stratosphere [5, 15]. The latter can also produce Cl atoms to destroy O3, upon photolysis in the spring polar stratosphere. Subsequently, numerous data from field measurements of total O3, CFCs, CRs as well as O3- loss induced stratospheric cooling over Antarctica over the past five decades were examined by Lu and Sanche  and Lu [14, 15]. These data have provided strong evidence of the cosmic-ray-driven electron-reaction (CRE) mechanism for the O3 hole. mechanism only played a minor role [14, 15]. 0.03 W/m², which represented only ~17% of the calculated ΔF of +1.7 W/m2 by CO2, together with a small ΔF of about -0.05 ± 0.1 W/m2 due to stratospheric O3 depletion. One of them is solar, so it would sit happily with this study. Until ‘Cloud’ experiment comes up with a positive confirmation, it is probably wise to reserve the judgment. Energy contained in the atmosphere is feeble, in contrast to the huge amount of energy contained in the world oceans, the likely engine of the world climate change. While the sArctic ocean ummer ice goes steadily down we are fine, once the Arctic ocean summer ice starts rapidly going up we are in trouble, and no amount of cosmic rays or ozone is going to make any difference. Unfortunately, the the GHE is effectively a constant set by the effect of the major GHG, water vapour, reducing the emissivity of the Earth’s surface. I don’t think it is human CFCs that are responsible. Instead it would appear to be a natural variation in the mix of wavelengths and particles from the sun altering the balance of the ozone creation / destruction process differentially at different heights. This will prove a little inconvenient for the Global Warming Industry, if it can be confirmed. All making their contribution towards the modest upswing in global temperatures over the past 150 years, for which we should all be grateful – even alarmists!!. Alarmists obviously are only prepared to consider Number 8, although they are responsible for Number 6. This guy will probably be put on top of the “Black-list” !! Or is no one talking about the “Black-list” anymore? Any CAGW’ers that could fill us in on that one? Anyone? tallbloke, now that is a graph I can accept. I read it as -0.2C in 1850, +0.4C in 2000, that’s 0.4C/century slope and has dropped about 0.15-0.2C since 2000. Nice reconstruction there! I still reserve the remote chance that a *possible* co2 influence of about 0.3C/doubling exists putting the current maximum of this effect at about 0.13C since the industrial revolution. But that’s all, 0.25 – 0.4/doubling derived from actual measures. However, even this small component might be coming from secondary effects as this paper implies and is still just assuming co2 effects though that is approaching zero the closer we look. Now, gee, who would have considered that but the skeptical scientists? Really, who else? Of course that theory sinks once you realize there were warmings before 1960 without the benefit of CFCs in the atmosphere. The scientific journey of the explanation of the ozone hole could be seen to parallel the journey we are on with CO2 and CAGW. Was the science right in the 70’s and 80’s, that liberated Cl ions will deplete ozone? Yes. Were CFCs contributing to the amount of Cl ions? Yes. Was the contribution in concert with natural factors significant? Current research says no. Are we better off emitting less CFCs regardless? Yes. Is the old science right that CO2 is a GHG that will increase air temperature? Yes. Are humans producing CO2? Yes. Is the contribution in concert with natural factors significant? Current research says probably not. Are we better off emitting less CO2 regardless? Yes. The big difference between the two is that the alarmism which produced the Montreal Protocol pales in comparision to the upheaval that would be caused by the same kind of concerted effort to reduce CO2 emissions. This will convince Leif for sure! Freshwater withdrawals have tripled over the last 50 years. Demand for freshwater is increasing by 64 billion cubic meters a year. The climate (temperature) has warmed for the last 50 years, therefore water consumption is the culprit. Bikinis have shrunk in coverage for the past 50 years. Demand for more skin has been increasing, causing more heat and global temperatures to rise. Smaller bikinis are therefore the new culprit. Well, plenty of people have been saying for a while now that the conventional ozone theory is crap. Looks like they may have been right. Lu’s finding that “observed data have shown an 11-year cyclic variation of polar O3 loss” looks like the killer blow (well it would if science followed the scientific process). So why oh why, after the good work using proper scientific observation, does Lu then try to claim that CFCs etc have caused the observed global warming, using the highly dubious “climate sensitivity factor α=0.9 K W-1m2 and a climate feedback amplification factor Β=2” for which there is no support. To me, it looks like yet another piece of valid scientific work being corrupted by the need to relate everything to ‘climate change’. The Empir(ical Data) strikes back! ckb – you say “Are we better off emitting less CFCs regardless? Yes.“. If the conventional ozone theory is indeed crap, then there is no basis for your assertion. Add Quin-Bin Lui to the Canadian anti- CAGW blacklist joining Ball, McIntyre, McKitrick, Patterson, and others. Watch for dismissive comment from University of Victoria’s Weaver soon. Does anyone knw of a paper that correlates 19th and 20th century land use changes to industrialization patterns? 1. Ryskin, G. (2009). Secular variation of the Earth’s magnetic field: induced by the ocean flow? New Journal of Physics 11(6), 063015. doi: 10.1088/1367-2630/11/6/063015. Sidorenkov, N.S. ; Lutsenko, O.V. ; Bryazgin, N.N. ; Aleksandrov, E.I. ; & Zakharov, V.G. (2005). Variation of the mass of the ice sheet of Antarctica and instability of the Earth’s rotation. Russian Meteorology and Hydrology 8, 1-8.
h/t to Marcia Wyatt for a timely reminder & an indispensable tip. Polar atmospheric CO2 trended along with ice cloud tau and oppositely to total column ozone, suggesting that lower stratospheric temperatures are instrumental in ozone reduction. That’s my feeling, too. Once we get to large enough summer minimum ice cover in the Arctic, the system “flips” to cold. Arctic ocean ice is, I believe, the “thing” that tips us in and out of interglacials and why I believe that the rebound out of glacial to interglacial happens so quickly. It isn’t so much the albedo on the land area as it is the albedo on the Arctic Ocean. Once arctic ocean ice melts, Earth can warm quickly in summer even with the surrounding land mass still covered in thick ice. The key is summer ice minimum. Once that rises above a certain threshold, the system quickly “flips” cold and can’t recover again until insolation returns to a level that will again allow arctic sea ice to melt back. Antarctic doesn’t count much because that is ice all the time locked by Antarctica. Southern Hemisphere total albedo doesn’t change as drastically as Northern Hemisphere albedo does. The tip into glacial seems to take a while because the increase in albedo on the land mass grows slowly and increases over time we are generally at glacial maximum when the arctic ocean finally clears of ice. Even a foot of ice over the Arctic is enough, it doesn’t have to be thick. Then once you get enough open ocean, wham, the system “flips” in the other direction. The arctic sea ice is, I believe, the “hysteresis” mechanism between two relatively stable states. The basic problem here is that by moving away from R-12 we needfully increase CO2 output throughout the life-cycle of refrigerant products. This includes manufacturing, recovery/recharge, and operation energy costs. It is simply not possible to state that it is a ‘good’ to reduce both of these as reducing CFCs increases CO2. One must pick one or the other or state a valid balance between them to be sought. Or, run for political office; politicians promise unicorns all the time. Allright skeptics.. show me your stuff. What is suspect with this paper. hints follow if you miss the obvious. The first few paragraphs should give you a clue merely based on the language…notice something odd? I would also dismiss this paper as being largely speculative. I do not exclude the possibility of some CFC influence but probably very, very small. There are no real measured results in this study that would show us a scale. My results for the drop in maximum temps. in degrees K/ annum versus time shows a natural deceleration curve as if someone threw a ball. Eventually I realized it must be like an a-c curve. That would suggest a natural process . If it were man made I would have found scatter and noise. Interestingly enough, I did find ozone decreasing at the beginning of the fifties (when warming started) and going up again from 1995, when cooling started, looking at maxima (energy-in). It correlated that way on both the NH and the SH. Too much of a coincidence there, for sure. My results suggest a 88 year sun cycle, most probably causing minute changes in the UV, that affect the reactions of HxOx, NOx and Ox on top of the atmosphere, those chemicals in its turn (due to changing concentrations) causing a change in back radiation of high energy photons. Mosh from my perspective, this paper only explains warming during the rise of CFC’s in the atmosphere, but cannot deal with warmings prior to that, like from late 19th century to about 1940. The paper is a bit defensive, since he’s defending against Grooß and Müller (not the Berkeley Muller you are now aligned with). Still I thought it was interesting and worth discussing. However, if you want to play crypto-Mosh again in comments like you tend to do, leaving incomplete points, I think its simply better that you don’t play that game and put all your issues on the table in one complete comment. Well I have always been suspicious (but not dismissive) of the CFC-Ozone hole link; primarily, because of evidence for the existence of ozone holes, long before their were ozone holes to talk about, or CFCs (but other halocgen sources). The nature of this evidence consisted of known variations in the apparent color Temperature of sunlight, and the attribution of this effect to variations in the near UV solar spectrum as seen on the surface, (and upper atmosphere balloon results). Now of course we know from folks like Dr. Svalgaard and colleagues, that the extra-terrestrial UV spectrum of the sun itself is also not constant, and folks like me might call that spectrum anomalous, in the sense that it messes up the nice fit to a single Temperature Black Body spectrum. Now of course we know the sun is not isothermal, and the corona, apparently has million degree sort of Temperatures; but I’m not going to guess that is the source of the UV anomaly, because people who want or need to know like Leif understand most of that stuff, so I can just read their papers. So how much of surface sunlight is Solar based, and how much earth upper atmosphere based, is a complication, I’m also not going to worry about, because like others, I believe the major play is in the deep ocean energy storage. Atmospheric effects, as dramatic as they can make the weather, would seem to be just changing the color of the icing on the cake, as far as climate goes. But I guess I am curious enough to read through this paper/essay to see what they are saying. My question is how do we know the ozone hole wasnt always present, its just that from the 1950’s we had the instruments to measure it? My question is how do we know the ozone hole wasnt always present, its just that from the 1950′s we had the instruments to measure it? In fact, my first investigation into this showed maxima rising faster in the SH than the NH. In contrast, I was puzzled that landmasses in the SH were not warming like in they were in the NH, looking at the means. = that suggested a reaction specific to heat being absorbed by water and distributed by currents and weather to the north. ……….the ozone&others shield is much lower in the SH ….so more energy is let in…. So in actual fact, we here in the SH have earth’s biggest storehouse of energy….. Note also my comment earlier. About what? That Global Warming is man made through the emission of CFCs? tallbloke, now that is a graph I can accept. I read it as -0.2C in 1850, +0.4C in 2000, that’s 0.4C/century slope and has dropped about 0.15-0.2C since 2000. Nice reconstruction there! I still reserve the remote chance that a *possible* co2 influence of about 0.3C/doubling exists putting the current maximum of this effect at about 0.13C since the industrial revolution. I’ll be writing it all up for a big post soon. One wonders if they’ve considered investigating the DET/CRE mechanism for adsorbed CO2 as a production pathway for OH radical which is also very reactive with O3? back when I was in grad. school in the 1970s around the beginnings of the yapping about ozone holes and cfcs, I was told by one of the faculty that the variation in ozone at the south pole was first observed during the international geophysical year, 1957, which seriously predates any possible significant contributions of R11 and R12. Why does the HADsst3 data stop five or more years ago? 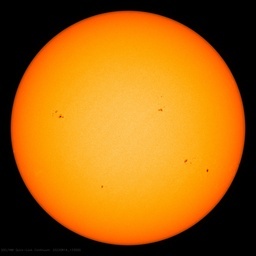 So the solar proton event in July 2000 resulted in elimination of “9% of the ozone in the upper stratosphere and up to 70% in the middle mesosphere over a period of several days in the northern polar regions above 60 degrees geomagnetic latitude (Jackman et al, 2001, referenced in Evidence for a Solar Flare Cause of the Pleistocene Mass Extinction, LaViolette, Paul. Radiocarbon, Vol 53, No 2 (2011)).” The SPE of 12,837 BP was estimated to have been 30 times larger. The cosmic-ray driven electron-induced reaction of halogenated molecules adsorbed on ice surfaces has been proposed as a new mechanism for the formation of the polar ozone hole. Here, experimental findings of dissociative electron transfer reactions of halogenated molecules on ice surfaces in electron-stimulated desorption, electron trapping and femtosecond time-resolved laser spectroscopic measurements are reviewed. It is followed by a review of the evidence from recent satellite observations of this new mechanism for the Antarctic ozone hole, and all other possible physical mechanisms are discussed. Moreover, new observations of the 11 year cyclic variations of both polar ozone loss and stratospheric cooling and the seasonal variations of CFCs and CH4 in the polar stratosphere are presented, and quantitative predictions of the Antarctic ozone hole in the future are given. Finally, new observation of the effects of CFCs and cosmic-ray driven ozone depletion on global climate change is also presented and discussed. I really don’t see how this paper works. Most of the effects of the ozone depletion are seen over the South Pole (Antarctica), yet this region has been cooling over the past 30-40 years. Ergo, the hypothesis fails at this point. Also, I fail to see how the extremely minute amounts of CFC’s in the atmosphere could possibly have the transformation effects that it is being attributed. It is simply not PHYSICALLY possible! Do the mathematics, it does not add up. Just being sarcastic (bad habit). If you want to take that position you are welcome of course. But the paper seems to be about ozone destruction / cosmic rays via a speculative chain of reactions involving CFC’s. The reference to global warming seems gratuitous. Just being sarcastic (bad habit). If you want to take that position you are welcome of course. Yes, sarcasm has no place in serious discussion, and the position seems to be the one, I was supposed to be convinced about. What else? Graph says “Reconstruction of HADsst3 sea surface temperature using SSN + AMO – SOI”. The SOI values prior to 1935 should be used with caution. There are questions regarding the consistency and quality of the Tahiti pressure values prior to 1935. And it appears that early data is in about half of the graph. These SOI values are similar to those calculated by the Climate Prediction Center in that they have been derived using normalization factors derived from monthly values. CPC divides their values into pre-1951 (only standardized available) and 1951-present (anomaly and standardized). So which values did you use? This is very interesting, although more study will be needed to confirm or deny. It would be amusing if while everyone was focused on the northern hemisphere surface temperatures, the tail wagging in the southern hemisphere was actually driving the planet’s temperature. SH cooling might explain the ice growth down there. I would like to learn more about “organic halogenated molecules.” There is plenty of chlorine in sea salt, and it does get sucked up to the very top of the atmosphere. I really don’t see how this paper works. Most of the effects of the ozone depletion are seen over the South Pole (Antarctica), yet this region has been cooling over the past 30-40 years. cancer risk. NZ has a higher rate of skin cancers than most. /O3 depletion reaction chemistry because the energy levels just didn’t seem right. However CRE + O3 without a CFC seems more realistic. Voice in the wilderness. Certainly magnetic field strength at the poles has a direct effect. O2 is fairly paramagnetic – attracted to a magnet, whereas O3 is diamagnetic- creates an opposite field and is repulsed. Note that the magnetic susceptibility of O2 increases with colder temps. Even if O3’s diamagnetism is not strong, it would tend to be pushed away from the poles by two effects: a) the direct mag forces and b) the attraction of O2 would displace O3 and other atmospheric gases. Experiment: In mid July, fly over the south pole and collect air. Measure the proportion of O2 relative to O3, N2, CO2, and noble gases. I’m betting a round of beers in Ottawa, Canada for those readers who want to make the journey that there is a measurable relative increase in O2. Does this rule out other causes? No, but let’s not let ignorance rule out this effect. I suppose with warmer arctic region as a whole, meaning the weather patterns had a huge play in what the summer melt ended up to, means also that land snow and ice in the arctic region may contribute to a higher volume of fresh water floating on the saltier water; especially if the previous winter was particularly wet. This would lead to a a quicker freeze this fall. Looking at Tallbloke’s graph, sea temps have increased with the last hundred years of increased solar activity. Land based temperatures have along side also risen so slight. General glacier melt confirms a warmer period. As the solar influence may begin to cool combined with other cycles that are cool cycles, all compound the cooling. As for the volume of gases that may have some minimal and theoretical impact of temperature (not climate) I have trouble believing they could overcome the greater influences that are more obvious. That is why they are obvious. For example, it is obvious Antarctic region has more ice then on recent record. If atmospheric gases both natural and man made had a warming effect, they weren’t very influential of late. Voice in the wilderness. Certainly magnetic field strength at the poles has a direct effect. O2 is fairly paramagnetic – attracted to a magnet, whereas O3 is diamagnetic- creates an opposite field and is repulsed. Don’t worry about being a voice in the wilderness. I am a Christian, too. Your comment here intrigues me. Do you have any proof for that? And how would this explain the fact that the ozone layer (& others) appears to be much less pronounced in the SH than the NH? The actual result is exactly backwards from this statement. Arctic Ice loss – ANY further reduction from today’s 3.4 million km^2 at minimum sea ice extent! – is utterly meaningless in the earth’s albedo. In fact, when you run the “reaL” numbers for reflection of light and heat energy from a rough water surface, the MORE ice that melts at the Arctic “summer” (which actually occurs at the mid-September equinox), every square meter of ice that melts fro ANY cause in the Arctic means more energy is lost from the newly-exposed arctic ocean by evaporation than is absorbed from the sunlight coming down at a miniscule 8 degrees above the horizon. This is because there is almost NO Arctic Sea ice at ANY latitude south of 81 north at time of minimum Arctic sea ice extent. If no ice is present under today’s real world conditions south of 80 north latitude, then additional melting of sea ice cannot change temperature. Further, almost no land ice (other than Greenland’s far north icecap) is north of 80 north either. The INTERIOR of Siberia, Finland, Sweden, and Canada are warming because of CO2 feedback – BUT that is because every plant and tree and bush and shrub across the tundra and forests is growing 13% to 27% stronger, faster, higher, with more leaves and stronger stems and branched. Albedo – from the darker ground in the interior – is of course higher. Not in the CAGW community’s precious and perfect model assumptions, but in the real world its higher. Since the edge of the Antarctic sea is in a rough crown around the Antarctic continent at 61 degrees south latitude, the sun’s energy IS absorbed by the open ocean water around Antarctica, and IS reflected by any ice over that water. Thus, ANY increase in Antarctic sea ice DOES increase the earth’s reflection of solar energy, and DOES reduce the earth’s temperature. Decreasing Arctic Sea Ice from today’s levels at mid-September reduces the net earth temperature since more evaporation occurs from the Arctic, and no additional solar energy is absorbed. Increasing Antarctic Sea Ice from today’s levels at mid-September reduces the net earth temperature since more solar energy is reflected from the Antarctic waters by the new ice, and the energy previously absorbed into open water is now reflected into space, where it is lost. but is this trend not exactly as I predicted/? e.g, do you have any calibration certificates of the thermometers used at that time? and did they go and measure every 6 hours or so to get a mean? Now remember, the CO2 feedback i am referring to in this statement is NOT from conventional CAGW “greenhouse theory” but rather the “darkening” (greening) of the planet’s surface due to the increased growth of the planet’s plants, shrubbery, and bushes. Anchorage, on the coast and (nearly) surrounded by high mountains often covered with snow and rock (thus no change io plant growth and albedo), will get off-ocean breezes and so little GHI (Greenery Heat Island) effect on much of the nearby areas. Compare your mountains and nearby ocean waters with the thousands of km’s of open tundra and forest in central Canada or central Russia where NASA-GISS insists on finding catastrophic “arctic” temperature increases. –*…. rather the “darkening” (greening) of the planet’s surface due to the increased growth of the planet’s plants, shrubbery, and bushes. Anchorage, on the coast and (nearly) surrounded by high mountains often covered with snow and rock (thus no change io plant growth and albedo), will get off-ocean breezes and so little GHI (Greenery Heat Island) effect on much of the nearby areas. It sounds like you’re implying CO2 is a pollutant, which it isn’t. It doesn’t matter how much of it we pump into the atmosphere; more is actually better. CO2 lags BEHIND temperature change; it doens’t cause it. Also, aren’t CFCs heavier than air? Someone can correct me on this.